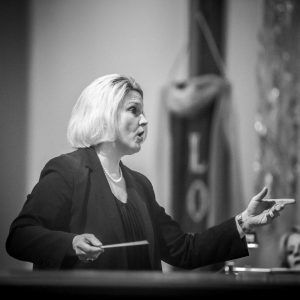 Jennifer Langley has worked in the field of choral and vocal music for 25 years. She holds a Bachelor of Arts in Music degree from Agnes Scott College and a Master of Music degree from Georgia State University. Highlights of her teaching career on the elementary, secondary and collegiate levels include positions at Woodward Academy, The Wesleyan School, Brenau University and Agnes Scott College. She served as Artistic Director of the Atlanta Youth Choir from 2000-2005 during which time the choir gained national recognition through an acclaimed performance on Public Radio International’s From The Top. Jennifer worked as the Children’s Chorus Master for the Atlanta Opera from 2001 to 2010 and again in 2013 where her choruses consistently received outstanding reviews by the Atlanta Journal Constitution. She was the Director of Music Ministries at Good Shepherd Presbyterian Church from 2010 to May of 2017. Jennifer will begin service as High School Choral Director at Providence Christian Academy in August 2017. Jennifer has served on the Executive Board of the Atlanta Chapter. of Choristers Guild since 2013.